Google Weaving Stop-time, commissioned by 4th Istanbul Design Biennial (2018). The biennial is curated by Jan Boelan under the theme “A School of Schools”. 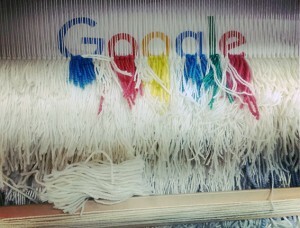 Google Weaving Stop-time is a participatory project which has connected over twenty hand-weavers via Facebook. 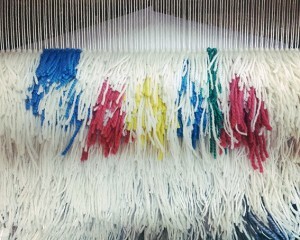 Collectively gathered around a shared assignment and through an encapsulated moment from a Google picture search, participants created tapestries based on the same search phrase “textile-labour-Turkey”. 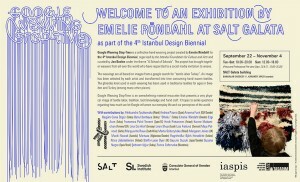 Participants have created the works in their own studio settings with the shared goal to meet together in an exhibition. With the act of making something with one’s hands – in this case a tapestry - we make a way of connecting in this world. 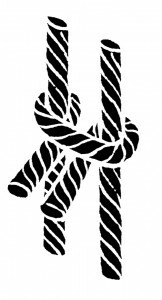 The technique shared is the Scandinavian rya knot, also known as the ghiordes or Turkish knot - a knot that has been used for centuries in traditional textiles in both regions. Together with other flat-woven techniques such as kilim, pile-woven rugs appear as an essential part of regional culture in both Turkey and Sweden. Google Weaving Stop-time presents the audience with a globally made installation where digital images are transformed into a physical and material Google search engine. Many people and organisations made this project possible, besides the participants, thank you so much for support, advices and help from the beginning and along the way: Jan Boelen, Nadine Botha, Deniz Ova, Merve Yucel (thank you Merve for bringing pregnant me around in Istanbul for two days! ), Vera Sacchetti, Ils Huygens, Jenny Bergström at Swedish Institute, Suzi Erzahin at Consulate General of Sweden in Istanbul, Jessica Hemmings, Birgitta Nordström, Onkar Kular, Annelies Vaneycken, Rosa Tolnov Christensen, Helena Hansson, Angeliki Dimaki Adolfsen, Joakim Karlsson (for excellent graphic design work), Anna Ehrlemark (for making the beautiful rya knot logo and translating from english to serbian). Thank you everybody who helped me on the way to make this project possible by sharing , advising and suggest improvements: Lise Bjorne Linnert, Mardi Novak, Owyn Ruck, Swati Maskari, Nova Iskra (Relja Bobic), Isa Rodrigues at Textile Arts Center (New York), Annika Björkman and Annika Enquist at Iaspis. Thanks to Andy Hult for 24/7 support.